Home page for the Rees Harps Inc Website. Gifted Irish harper Marta Cook spends some time with a Mariposa Harp at the World Harp Congress in Vancouver. Harper and singer-songwriter Jana Bauerova just after winning a festival competition in the Czech Republic. Harper Nancy Davis gets close to nature with her Aberdeen Meadows Harp. 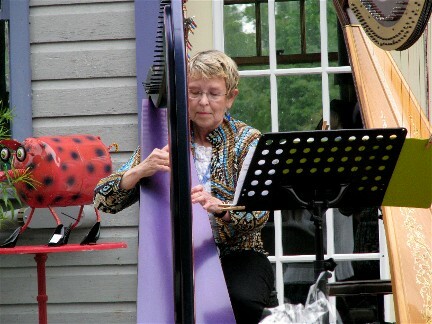 The constantly busy giging harpist, Cheryl Murphy, with her color-changing Aberdeen Meadows Harp. 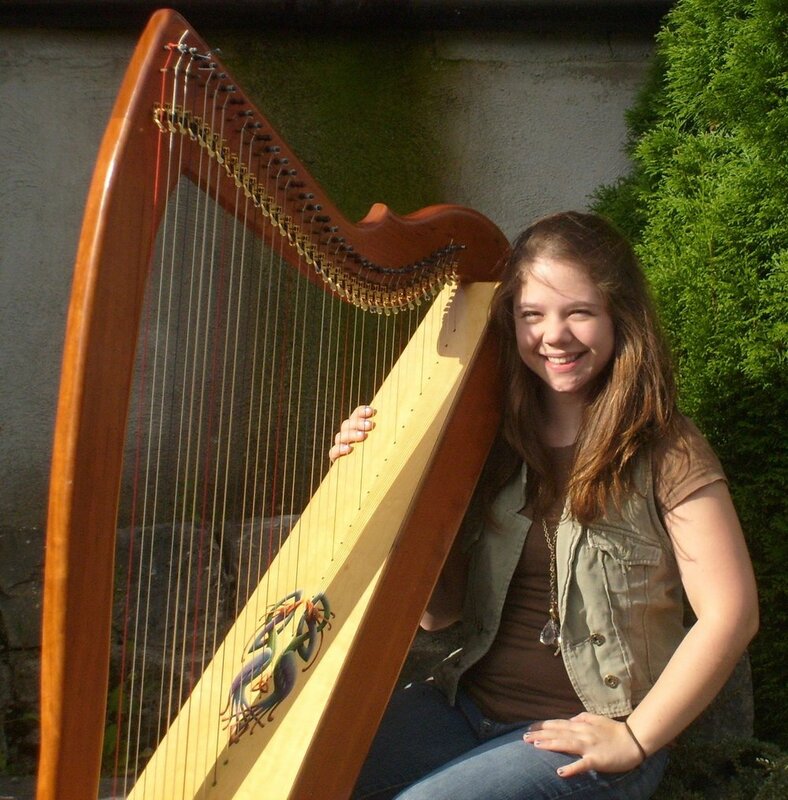 Harp competition champion, Lillian Reasor, with her Aberdeen Meadows Harp. 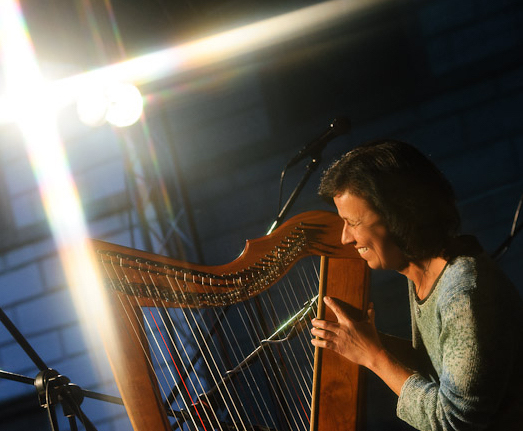 The fabulous double harper Cynthia Shelhart glows while playing her Double Shaylee Meadows Harp. Certified Clinical Musician on Harp (and our friend), Kathleen Brodzik, with John, the late, great Missy and her Morgan Meghan Harp. From our 36-string Rees Aberdeen Meadows Harp to our 23-string Morgan Meadows Harp, all of the harps in our Concert Lever Harps Line are built around what makes this harp the best harp for what you want to do. Whether you are playing for yourself on a 30-string Shaylee Meadows or playing for huge audiences on a 27-string Morgan Meghan, the job of each harp we make is to respond to and reflect the player. That we make both a C to C and an A to A Aberdeen Meadows Harp or both an F to A and an A to C 34-string Mariposa Harp is an expression of our commitment to this principle. We now also build a double harp version of all our harp models. And everything we build is available with either our multi-award winning standard or our fully custom ornamentation should you so decide. Your joy is our reward. Why do harp soundboards belly-up? Even if you have been playing harp for a long time you still probably have some questions about why things are the way they are with harps. It isn't always obvious and, to complicate matters, since harps have been around for something on the order of 4000 years all kinds of misconceptions have risen up along the way. In this section we start with the most basic things like parts of the harp and a glossary of lever harp terms, work our way through all kinds of issues related to things like string spacing or wood including our work to be environmentally responsible and even touch on things like how to find a harp teacher or a harp repair person. Lever adjustments or regulation are so much easier than you imagine. We walk you through it. In this section we begin with what to do when your harp first arrives along with tuning basics and tips. From there we provide information on everything from minimizing string breakage and preventing cracking to the regulation of levers. Harps do require maintenance and attention but it's nothing too difficult and we know you can do it. Don't worry about trying these repairs and know that if you have any questions it is our pleasure to be of service. Whether you want to contact us, want to know our story or want to know where we will be this year or during which holidays we are closed, you can find our all of that in this section. Also, with the exception of Garen (see photo of us pointing at right) there's probably something wrong with us...but you already knew that. Once you decide on the model then you get to decide on the wood and that's just the beginning. Even if you are a collector of harps, ordering a harp includes a number of decisions. In this section of the site we walk you through the decisions, answer common ordering questions and provide our terms and conditions so that we are all on the same page. Know that if anything is unclear, we are here and it is truly our pleasure to work with you to design the harp of your dreams. 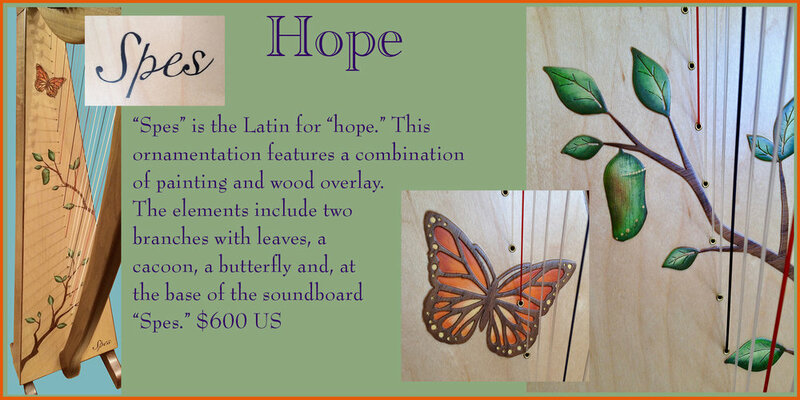 In the Rees Marketplace you can order your harp, choose the wood, select your ornamentation and find all your accessories. Our new Marketplace allows you to easily specify your custom harp and shop for your harp accessories at your leisure from anywhere in the world. Once you have decided upon a harp model, read about your wood choices and then browsed our ornamentation catalog (or decided to have us do something entirely custom for your harp) the Marketplace will accommodate the complexity of your order right here on-line. Our staff will then reach out to you to confirm all the details and we will get your new Rees harp underway.